iPhone users will probaly know the app iPhysics. Computer games will know the games The Incredible Machine and Line Rider. But what if you combine the power of those games in one? Than you'd have Phun. The falling sand game, that uses Java, does come pretty close to Phun. Gravity and different materials makes these so interesting and fun. I can't explain any more, just watch the video below. You can download this game at Acc.ume.se. If the application doesn't work directly, you should remove the folder phun/data. 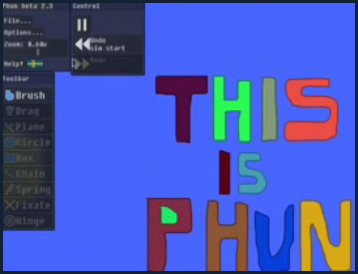 Have phun playing Phun and feel free to place your creations in the comments.